I woke up to rain this morning. It was about 6 a.m. and the day was silent apart from the constant rhythmic falling of the rain outside. It was the heavy windless winter rain, cutting through the empty air silently, to patter against the trees and houses alike. A gentle sound that drowns out any other noise as it completes its mission to ensure everything has been well doused for the day. This rain brings the ‘Green’ to England’s Green flowing fields. Combined with the sun it brings life to everything, it fills the reservoirs so we have water to drink and feeds our crops so we will have food to eat. Rain is the most essential of things. And yet, so many people spend so much time complaining about it. I mean really, how can you complain about something that is as fundamental to the land as the blood in our veins is to our bodies? Whenever I hear someone complaining about their wet journey into work, I just reply simply, ‘I don’t mind the rain’. It’s the truth, I don’t mind the rain. Without the rain, this beautiful country that we live in would be dry and barren. It is the rain that makes this country what it is. But that is people for you. The rain causes a little inconvenience of a morning, so they want it to stop. Never mind that we would all shrivel up and die eventually without it, they just spent £45 on that haircut, and that’s all that matters. To be honest, it doesn’t rain that much really, I mean, it does, but if you really look closely, most of the rain in this country is in the night, or the early morning. It’s actually quite good in that way. This morning it was pouring, but by the time I left the house, about 8.30 it was gone, a little cloud yes, but the rain had ceased falling and was now soaking away into the soil, being drunk up by the roots that depend on it so much. It was seeping through to the water tables to be distributed for later, saved for when we don’t have a rainy day! It doesn’t just come in one form; there are lots of different types of rain as well. From the gentle precipitation of a summer afternoon, so slight that the sun refuses to go away and the droplets dry up before you even notice they are there, to the Monsoon rains of the tropics in October, where the rain is so fierce it seems to even push the air out, as it dominates every empty space, soaking you in a second flat. There’s light rain, and heavy rain. There is cold rain, and there is warm rain. There is rain that stops as soon as it has started, and dries away before you have even noticed it is there, and then there are the heavy floods that wash people from their homes and leave despondent looking families complaining to the News Reporters that the government should have done more. There you go, that’s how you win the next election, legislate against the rain. All these rains have their beauty, but I have my favourites. Without a doubt for me, the best is the heavy downpours of the English Autumn. 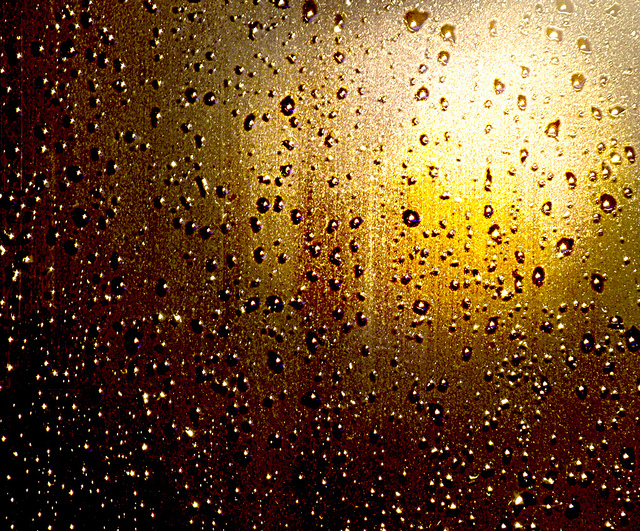 The rain that batters the window panes of an evening, whipped up by the wind, a constant and forceful battering of mother-nature on cold glass. Then tiny rivulets of water are picked up by the headlights of cars passing in the night, creating ever changing patterns on the walls of a darkened room. When I was a child, and most houses still had sash windows, the panes themselves would rattle with the force of the rain adding another dimension to the sound, and living by the coast, the wind would shake the cables on the masts of the yachts and fishing boats moored up in the estuary, creating a symphony of metallic ringing in the darkness. I would watch from my darkened bedroom, invigorated by the sheer cacophony of the weather. A little older, running became my thing and I would run for miles in the pouring rain, driven by the life giving essence of the downpour, marvelling as the hillsides lit up with bolts of lightning. To some it is rain, to me it is the solitude of the soul carved out by the sheer presence of nature. Another favourite has to be the early monsoon rains in South East Asia. The air is so beautifully hot, the day will be perfect, and then of an evening it will start to cloud over and a warm wind will whip up the air. You know you have mere minutes till it hits and then boom, the heavens open and the rain starts to crash down all around you. I have floated on the river Kwai on my back as these rains fell, having already been immersed in the water, the fall of the rain just adding to the experience, the falling rain even warmer than the river itself, completing the aqueous envelope of the moment. Another time, after a period of travel, I had holed up in a bamboo and tin beach hut on the south coast of Kho Phan Ngan. Without fail of an evening the rains would come, just for an hour or so, and I would lie in my hammock with the air luxuriously warm, and watch the falling rains crashing down in the forest all around, listening to the fall of the coconuts shaken loose by the downpour from their lofty nesting place in the trees. We get these experiences in the UK as well with the flash storms of the summer, when it goes from dry to rivers running down the suburban streets in minutes, a taste of the tropics thrown into the mix to keep things interesting. The rain is a personal thing to me I guess. I know I am not alone in my appreciation of its beauty, but I get the feeling I am in a minority. You only need to look around in a rain storm to spot the other crazies. We are the only people walking normally along the pavement with smiles planted firmly on our faces. Have you seen the first rains of the Greek autumn, flooding down the mountainsides and bringing boulders crashing down onto the roads, loosened after a summer of baking in the sun? Have you seen the rain in Calcutta filling up the streets with water so fast that you are walking knee deep in an unexpected river, wondering where the recently dug road works are? Have you hiked in the Malaysian rain forest and compared numbers of leeches attached to your leg at the end of each day? If you have you might just understand what I am talking about. Whatever, I do not expect you to agree with me, but I can only say that when it rains I look up to the skies the smile that spreads across my face is from the memories of a thousand experiences washing over me with the falling rain. Good points. We shouldn’t complain, especially here in SoCal where we’ve had lots of drought. I loved your beautifully written lyric to rain!! (Except for the leeches, but you were justified in including them, based on the overall message of your piece.) All of the imagery was exquisite, and experiencing it made me happy in general and thankful for rain. You outdid yourself on this one! Thank you Liz. I have always been a fan of the rain. I am glad you enjoyed. Beautiful piece which could almost make me appreciate rain… as if! Most of the rain in Brittany is in the daytime unfortunately. Very often, the sky begins to get clearer in the evening, then comes the bright stars lit night sky! As for the Monsoon, I remember taking a rickshaw in Delhi to drop a few bags at the airport left luggage facility so that the last month of our trip would be lighter. It was the beginning of the Monsoon season. By the time we reached the airport we were drenched – as if we had taken a shower with our clothes on. So were the bags. Needless to say when we collected them a month later, mold was growing on them! I had a friend – another crazy one, the sort of person walking normally along the pavement with a smile on her face when it ran (accidentally) in Marseille. She moved to the French Basque country since (e.g. the Brittany of the South West!) – and her love for rain has been tamed there! Thank you Véro for your thoughts. I agree everything has to b taken in meassure, and on those days whern I am happily skipping along in the rain, four hours later when I’m drenched and cold is doesn’t have the same hypnotic affect, but I stand by my love for it. there is so much beauty in the rain. Hold on to your romantic love for Miss Rain. It suits you! By the way, I named my daughter Monsoon… So maybe I don’t detest rain that much!! Oh, that is the coolest thing ever!!! Everything’s great abut rains except the leeches. Leeches aren’t so bad. They are what they are. there are plenty of humans that do far worse to you every day!